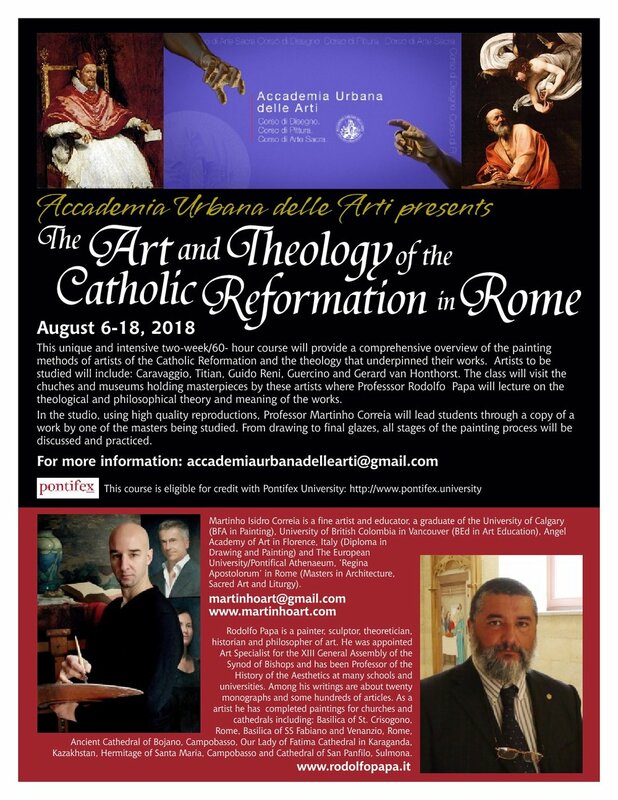 This unique two week/60hour intensive course will provide a comprehensive overview of the painting methods of artists of the Counter-Reformation and the theology that underpinned these works. Works to be copied will be selected from art and artists found in Rome. Artist to be studied will include: Caravaggio, Titian, Guido Reni, Guercino and Gerard van Honthorst. The class will visit the chuches and museums holding these works and Professsor Rodolfo will lecture On the theological and philosophical theory and meaning of the works. In the studio, . using high quality reproductions, Professor Correia will lead students through a copy of a work by one of the masters being studied. From drawing to final glazes, all stages ofpainting process will be discussed and practiced. The fee includes 10 days tuition with 60 hours of instruction. Minimum enrollment for this workshop is 5 (five) participants. Early reservations are recommended as student numbers are purposely limited to allow for a high degree of attention. The final balance for the workshop must be received by June 1st 2018. Please contact us for details on how to make payment. Cancellation Policy: No refunds on any workshops will be given for whatever reason. Any deposits/fees paid are non-transferable and non-refundable. A full refund will be given in the event that the Accademia Urbana delle Artishould, for whatever reason need, to cancel the course. In the event of cancellation of workshop for any reason we strongly advise participants to acquire travel insurance that covers any amounts paid for airfare and accommodation.